The client wanted a full house renovation. Inside and out. By Thanksgiving. And it was already October. However the first challenge was establishing an architectural style that stayed true with the neighborhood and reflected the client’s tastes. 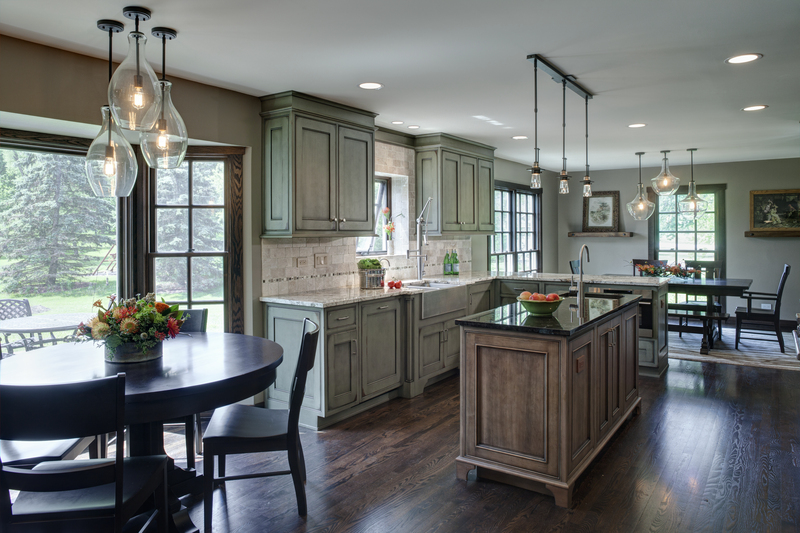 They settled on a Craftsman style while adding rustic contemporary elements as a secondary style throughout the interior space. The kitchen cabinet option they arrived at with Grabill was a custom color and distressing package for the green cabinets. At the same time, the island and beverage center were finished with a complementing wood stain on maple, also custom. They used Grabill’s G05, which has a matte sheen, on both finishes. Wood species: Maple for cabinetry. Cherry for table. Finish: Perimeter cabinets: WTPG 8281 SAD; Island and beverage center: TG6854 SAD; Table: Espresso. All this was done with the Thanksgiving deadline looming. “Grabill worked with us most expeditiously. They knew what we were dealing with. It was a tight schedule and I did not sleep much the week leading up to the deadline,” said Brandie. But voilà! Brandie’s team finished it the Tuesday before the big holiday, and the cleaning crew came in Wednesday morning. Suffice it to say it was a very happy Thanksgiving for all concerned!